I confess I myself sometimes feel like that cuttlefish spurting out ink, but that’s perhaps another story for another bedroom. The quoted line is from a timeless essay George Orwell wrote in 1946 called “Politics and the English Language,” which essay, like George Orwell himself, influenced many writers, at least one of whom later went out of her way to deny any influence. 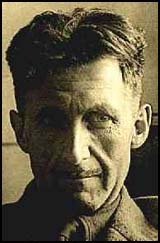 In his essay, George Orwell rather convincingly makes the surprising argument that there’s a direct and demonstrable link between politics and poor writing, between governments and the degeneration of language. His essay is a fascinating read — I can assure you not boring even to those uninterested in politics — and what one finds perhaps most striking about it is that it touches upon the profound connection that exists between thought and language, between the proper use of words and clarity in thinking. Generally I’m wary of the overly proscriptive, and this essay does have a little of that stench about it. Yet it’s so thoughtful and so well-written that it’s faults are easily overshadowed.